Microsoft has updated its SmartScreen web filter to defend against drive-by attacks in the company's latest tweaks to Windows 10. SmartScreen is designed to protect surfers from various malware and phishing nastiness that they may encounter when hopping about the web, and it has been updated for both Internet Explorer 11 and Microsoft's new Edge browser running under Windows 10. SmartScreen also warns users about things such as known scam sites, and now covers drive-bys, which are a particularly dangerous kettle of fish – they exploit known vulnerabilities and hit home merely by having the hapless surfer visit the infected web page (the victim doesn't have to be lured into clicking or downloading something). And the added danger is that often the sites carrying this malware are legitimate websites which have been hacked in some manner. Microsoft says that this new feature is a result of gathering a broad set of data from its web browsers, Bing, Windows Defender and the Enhanced Mitigation Experience Toolkit. All this intelligence has been pieced together to implement the system which provides the drive-by protection, and theoretically gets defences in place as these attacks emerge in the wild. In a blog post, Microsoft noted: "To avoid impacting browsing performance, SmartScreen helps protect against drive-by attacks by using a small cache file created by the SmartScreen service. "This cache file is periodically updated by your browser to help keep you protected and to ensure that calls to the SmartScreen service are only made if we believe there's a high probability of malicious content on a page." If dodgy content is detected, it will be blocked and you'll see a red warning notice. Of course, don't rely entirely on SmartScreen or other anti-malware measures to keep you safe, and always exercise common sense when web browsing. 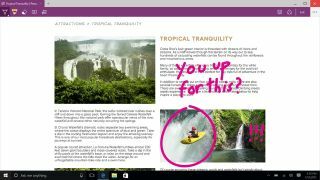 Microsoft about to (finally) add support for extensions to Edge browser?